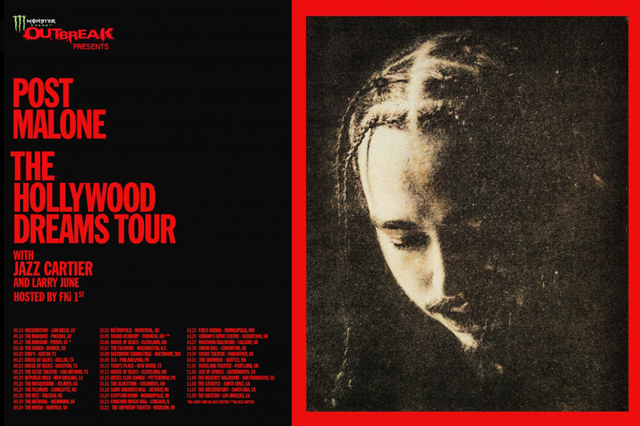 Post Malone just announced his upcoming fall tour, “The Hollywood Dreams,” with Jazz Cartier, Larry June and FKi 1st—the ticket preorder is available now. “The Hollywood Dreams” tour starts this September in San Diego at The Observatory rolling through 41 different locations before ending with a bang in Los Angeles at The Wiltern this November. After releasing his debut mixtape, August 26, and causing quite the stir, Post fans are still awaiting the release of his highly anticipated forthcoming album. But in the meantime, the tickets for “The Hollywood Dreams” tour are available for preorder HERE.